Last week saw the arrival of a bit of a crisis in our household. Several unrelated and individually easy to deal with issues collided to create a spectacular stress-bomb that blew up all over my and Lena’s home. Something had to be done. I snuck away and grabbed the phone. This was no job for mere chocolate or flowers. No, this required hotels and amusement parks, and fast. I got us into a Disney resort the next day, and we spent the following three meandering around Epcot, Hollywood Studios, and both the Animal and Magic Kingdoms. It was rejuvenating, and the best park experience either of us had walked away with in years — and we always have a good time. We left around four in the afternoon on Sunday, happy and calm, and Lena mentioned that she had always wanted to see an IKEA store. It sounded interesting to me, having never visited one before, so we looked it up on the iPhone and drove there. The parking lot was enormous, and on a Sunday afternoon, filled to capacity. This was clearly a destination spot. The closest parking was a several minute hike from the front door, but having just come from three solid days of walking, the two of us barely noticed. Happily, the lot was also dotted with signs to tell you what section your car was parked in, so as long as you could remember which identical green sign was yours, you were cool. I took a pic with my phone, which has better memory than I do, and we headed for the doors. Inside was chaotic and confusing. There were two massive stories of showrooms, and we had to look for the signs to figure out where to start. After a few minutes of searching, Lena spotted it, “Enter maze here ➡,” and we were off. One thing I realized immediately, was that if you needed a single item, and wanted to dash in and dash out, IKEA was not the store for you. Each floor is drawn out like some wacky science experiment involving mice and cheese, (more on the cheese later) and it is not possible to skip ahead from one department to the next. If you want to see anything, you must see everything. And there is a lot to see. It will take you forty-five minutes just to get through the top floor, (as much as two hours if your wife is with you) and another two-thirds as long for the slightly smaller downstairs. If you just need a can-opener, go to Target. Somewhat frustrating to non-Swedish natives is the naming scheme involved for all items there. 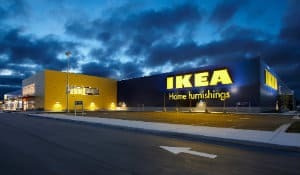 (And Danish, and Finnish, and Scandinavian — IKEA uses a mishmash of places, names, and terms in as many nordic-sounding languages as possible.) Each item is labelled with a giant semi-pronouncable name, like “Omväxlande,” and then in smaller letters beneath, a description of what the thing actually is. In this case, “Tray.” In some cases it’s funny, or entertaining; in others, maddening. IKEA stands tall on its pricing, as most items are dead cheap to buy. Quality seems to kick its legs back out again, as most items are dead cheap to make. Much more attention is given to how things will look on a showroom floor than how they will stand up in a home. That Solsta Olarp may look good next to the Söderhamn while you’re groovin’ on the fjernsyn, but don’t let your fat friends sit on it. Or anyone else, for that matter. We didn’t buy anything, and I’m not certain I ever would, but it was kind of fun for the cultural experience — and I no longer wish we had one of these in Jacksonville. If for no other reason I’m glad I went because all of the late night TV jokes finally make sense. 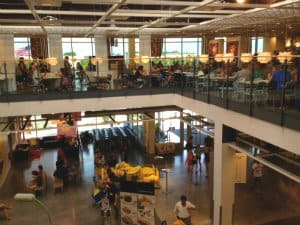 If you’re ever driving by and decide you want to pop your IKEA cherry, just make sure you’ve got plenty of time, don’t actually need anything, and are either very hungry or not hungry at all. If you do decide to take some furniture home with you, please remember that the wooden items are made of paper, the metal items are made of MDF, and if you see something made of stone, that’s just what they do with the leftover meatballs, so don’t get it wet. There *are* shortcuts, if you know where to look. I’m sure. Of course, I AM the noob. My older sister is a veteran shopper at IKEA in London. Not sure how they match up size-wise, but when I helped her refurnish, the one we went to was pretty big. Apparently planning is the key. Take a look at the website, pick out items that you want and make sure that the store actually has it in stock. When you get to the store, there are little terminals with data on the exact location of each item so you can find it. Also, there are maps so you can plot your route, and have designated ‘browsing areas’ rather than casually shopping through the whole place. Also pick a quiet time and bring a van. We ended up hiring one. Just a couple of thoughts. What qualifies as a “quiet time” at IKEA? I once slapped a piece of canadian bacon on a McDonalds door as I was leaving after I had waited too long for my custom egg mcmuffin sans canadian bacon. Obviously I didn’t have a Lena there to stop me. Congratulations on Your The Diabetus!